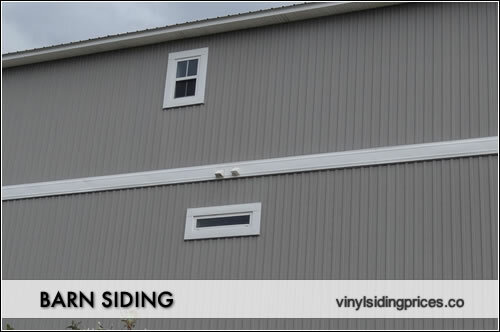 Barn siding prices ranges from $3 to $9 psf installed, depending on the material used for the exterior cladding. Most times, "barn siding" is used on a home with the intention of creating the look of a traditional barn - a rural, toned down affect. However, it can be also be used in conjunction with more modern or chic styles to create a retro cool look. For additional pricing, try our barn siding cost calculator page. Clapboard is the cheapest wood option and is can be used effectively with battens to create a classic look to a home. Traditional cedar boards would also be considered an option for the wonderful color and rustic appearance. Reclaimed barn wood is sometimes used to create the look of a vintage rural home (or on a portion of a home). The wood is not cheap, but when done correctly can look fantastic. Metals such as aluminum or steel panels can either work to create a more modern/commercial feel or a more rural, toned down look. The additional project materials such as trim, fascia, soffits, j channels, housewrap, nails etc. will usually run something like $1 to $2 per square foot. Obviously this will depend on the level of material you decide on and how much or little you need for your project. The labor and installation cost on a project such as this will depend on the type of panel you use. Metal panels demand more expertise and will command a higher per square foot price, while simple plywood is on par with vinyl cladding. Reclaimed wood that is somewhat fragile and more "artistic" in presentation will mean an attention to detail that low end installers will probably not possess. Clapboard will run from $3 to $5 psf installed and this includes all of the project materials and the labor and installation cost. Traditional cedar siding will run from $3.50 to $6.50 psf installed and this includes all of the project materials and the labor and installation cost. Reclaimed barn wood will run $4.50 to $8.50 psf installed and this includes all of the project materials and the labor and installation cost. Metals such as aluminum or steel panels will run $5 to $9 psf psf installed and this includes all of the project materials and the labor and installation cost.